More than 1,200 working chickens provide 365 days of turning and cleaning compost for the Vermont Compost Company, located on 5 hilly acres within the city limit of Vermont state capital, Montpelier. The expert composter chickens eat entirely off the composting food residues — no feed is purchased for the birds. 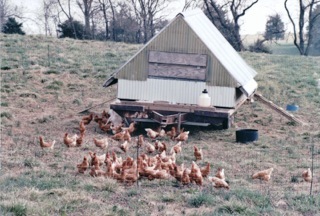 They provide an average of 1,000 eggs per month for the local egg shed while merrily clucking and creating compost and top soil.